So far, we have only plotted our waveforms as functions of time—the horizontal axis of our plots has always been time. However, it is also possible to plot one scope channel as a function of another scope channel. These types of plots are called XY plots, and are very common. For example, Lissajous figures (plots of one voltage as a function of another) are useful in determining time delays between voltage signals, and voltage-current characteristics (plots of the current through a component as a function of the voltage across a component) are useful in developing mathematical descriptions of the component. 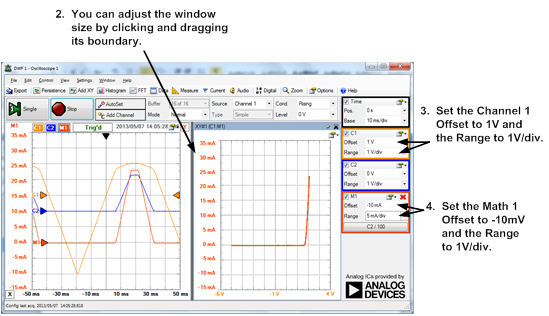 In this project, we will use the Analog Discovery™ to plot the voltage-current characteristics of a light emitting diode. Complete the fourth scope project relative to Math Channels. 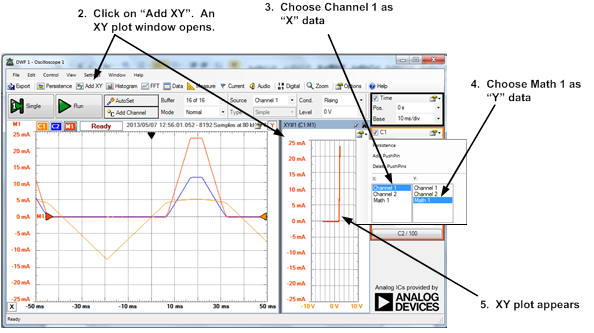 Use the Analog Discovery oscilloscope to create XY plots. If you have completed the previous Math Channels project, your oscilloscope display should look similar to the display shown at the end of Part D before continuing this exercise. We want to put the current through the diode on the vertical axis of our plot, and the voltage across the diode on the horizontal axis of our plot. The current through the diode is the same as the current through the resistor, I, per the schematic to the right. The XY plot scale is set by the scale in the main time window. To change the scale on the XY plot, you need to change scales on the individual channels involved. An example is shown below. Try plotting a voltage-current characteristic for the resistor. Put the resistor voltage difference (channel 1) on the vertical axis, and the resistor current (the Math 1 channel) on the horizontal axis. Your XY plot should be a straight line. To change the selections of the X and Y data, click on the icon in the XY plot window. Choose the data as in step C above. Ohm's law states that, for a resistor, V=IR. Therefore, your XY plot should be a straight line; the slope of the line should be the resistance of the resistor, 100Ω. Check the slope of the XY plot against this expectation.